Maldives gives free 30 day tourist visa to all nationalities. Tourist visa is given on arrival to the Maldives, no prior visa is needed to enter Maldives. To be eligible for tourist visa you must meet the following conditions. • Hold a valid passport, with at least 3 months before expiration. • Hold a confirmed hotel reservation. You may be asked to present hotel voucher at the Immigration counter in the airport. Please keep a copy of hotel voucher with you to present at Immigration counter if requested. • Have ticket to fly out of Maldives at the end of your holiday. It is not necessary that you go back to your country. You do not need any photo, they will put a stamp (like above) on your passport. 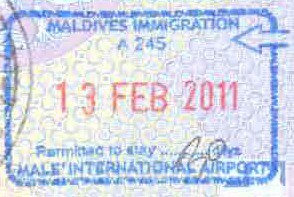 If you meet above conditions you will get your Maldives visa as a tourist. Normally it is 30 day for tourist visa but the Department of Immigration and Emigration reserves the right to allow less than that. If you do not have a confirmed hotel reservation you, in most of the cases, you will get your visa. But, there has been cases of deportation due to lack of hotel reservation. Most of the cases the Immigration Department checks if you have enough cash (US Dollar 150 per night) in hand and allow your entry to the Maldives. Again, it is an unwanted risk. If you need more than 30 days you can get an extension of further 60 days making the hotel stay 90 days. You can submit the filled application form at least 2 working days prior to expiration of your tourist visa. It is recommended that you submit about a week on advance. The Department of Immigration and Emigration reserves the right allow or deny the application, normally it gets approved without a problem. Visa extension is one by the head office of the Department of Immigration and Emigration at Huravee Building, 3rd Floor, Ameeru Ahmed Magu, Male'. There is a charge of MVR750 for an extension of 60 days. If you did not extend the visa and it got it expired while you are in Maldives you may be deported from Maldives. For more information please contact +960 3330444. Under tourist visa you are not allowed to work in the Maldives. If found working, you may be departed. Your tourist visa may be revoked if involved in politics or unlawful activities. Maldives is a 100% muslim country, while visiting airports and local residential islands you must cover from shoulder to knee. You can wear your bikini at resorts or uninhabited islands and do sun-bathing. Bikini is not permitted in local residential islands, even on the beach. If you are planning to work in Maldives you need to apply a job and get it approved from a company based in Maldives. If that company wants to employ you they will submit your documents to Department of Immigration and Emigration to get work permit. Once Employment Approval is given you can enter Maldives and upon arrival you will get your Resident Visa. Pay attention not to enter under tourist visa, if do you it cannot be cancelled and tourist visa cannot be changed to Resident Visa, you will have to leave the country and re-enter. If are planning to visit Maldives on a business trip your local representative may submit your documents to the Department of Immigration and Emigration and obtain Business Visa under which you can stay in Maldives for up to 90 days. The process usually takes 2 business days and costs MVR750. To be eligible you should hold at least a diploma qualification. If not you can present a letter from your overseas company or entity stating your competency in line with the purpose of visit along with certificates you may have. If you are arriving Maldives on a valid purpose there is usually no objection from the Department of Immigration and Emigration. You cannot enter as a tourist and get Business Visa. If you did enter as a tourists you will have to make a re-entry.